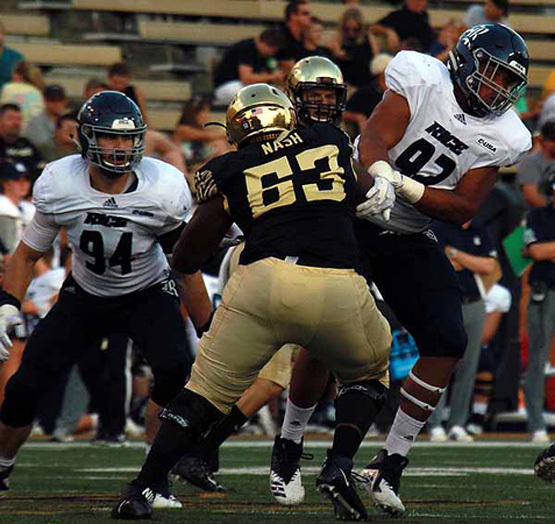 WINSTON-SALEM, NC (Sept. 30) – Just over ten minutes into Saturday’s game between our Rice Owls and the homestanding Wake Forst Demon Deacons, the visitors had spotted the home team to a 21-0 lead, while during the same interval having compiled zero first downs and eight yards of total offense. At that point, did it kind of look as if it was going to turn out to be a long afternoon for the Boys of the Institute? Guess you could say that, yes. For the second straight week, the Owls started slowly, generating little snap and crackle on offense and lacking much of a killer instinct on defense. Meanwhile, the Deacons, fresh off a stinging 56-27 home loss to Notre Dame last week, came out ready to do business. And do business, they did. The primary negotiator in this session was a quietly spectacular Deacon wide receiver and deep back by the name of Greg Dortch. The diminutive 5-9, 170-pound sophomore from Richmond, Va., seemingly was everywhere on field, usually with two or three Rice defensive backs vainly chasing after him. He hauled in four touchdown passes on the day in about 40 minutes of action, garnering a total of 163 yards in receptions. And it was only the huge punt hang time and the deep kickoffs of Jack Fox which most likely kept Dortch from torching the Rice special teams in like manner as he did the beleaguered Owl secondary. Turns out, they had it all figgered out from the get-go. Dortch started the scoring three minutes deep into the game when he got behind three Rice defenders and hauled in a 54-yard TD pass on the fly. Next, after a second, consecutive Rice three-and-out, Wake ground out a 55-yard, 7-play touchdown drive utilizeing the delayed handoff to Carlton Carney six out of seven plays to go the distance. Take the snap, belly the ball, assess the defense, bob and weave to daylight, and pick up 6, 8, 10 yards each time. After another Rice three-and-out, next possession Wake decided to have a little Fun with Passing, distributing the ball to Dortch and Time Surratt en route ton all-through-the-air seven-play, 61-yard drive. Next possession, the Owls picked up their intial first down of the game when Shawn Stankavage hit Austin Walter on a third-down crossing pattern. Alas, a couple of plays later, a Stankavage passed was tipped (again) and picked off by Wake’s Luke Masterson, who returned the ball 49 yards to the Rice 18. From there, the Deacons’ Cade Carney got the call seven straight times, eventually pounding the pill across from the one yard line on third and goal 28-0, Deacs. An Emanuel Esupka dive as stuffed on third and three at the 21, however, and the Flock had to settle getting on the board by way of a 39-yard Jack Fox field goal. Next possession, it took Wake QB Hartman little time to find Greg Dortch in the clear again, this time for 38 yards and the score. Things went from worse to worser next Owl turn with the ball when Emmanuel Esupka was separated frm the pigskin whereupon it bounced right into the hands of Wake’s Essang Bassey who romped in untouched for a 51-yard scoop ‘n score. 42-3, Wake, a little under 25 minutes deep into the game. Yep, you heard that right. The Owls did move the ball on their next possession, ending the half with a missed Jack Fox field goal try from 38 yards out. Rice played harder, more intensely, and at a greater level of self-awareness in the second half, and did manage three touchdowns in the last two stanzas, but you’ll of course want to spoil the notion that this was any kind of bona fide comeback effort by insisting it was against Wake Forest’s second and third unit players. That’s only partly true. WF coach Dave Clawson began to substitute hear and there, but kept his starting quarterback and, of course, Greg Dortch, until the waning moments of the third quarter. Consequently, the Owls and the Deacons spent the better part of the second half trading scores. To begin with, the Rice defense forced its first three-and-out of hte game when Houston Robert got a big sack of WF quarterback Hartman on second and 12. First play after the ensuing punt, Austin Walter took a deep handoff – more or less a draw play -- and immediatel stiff-armed a couple of would be tacklers, bouncing outside and sprinting 47 yards down the sideline to the Wake Forest 25. Austin Trammell next snagged a pass across the middle for 17 more, almost scoring on the play. And then on first and goal, Austin Walter grabbed a sideline pass and sprinted in for the Owls’ first touchdown of the day. They’d get two more before the final whistle. While Wake roared back for an all-in-the-air quickie response TD to make it 56-10 (so there! Take that! ), Austin Trammell returned the ensuing kickoff 54 yards to the Deacon 38. First play, then, Austin Walter took the inside handoff and burst up the middle for the score. The Owls added one more tally just as the fourth quarter began, having driven 62 yards in 13 plays, with Shawn Stankavage hitting Aaron Cephus, who’d boxed out his defender near the end zone front pylon on fourth and one for the touchdown..
After that, and for most of the fourth quarter, the two squads were content to run clock with repeated dives into the line scrum. Rice had a possession with four minutes left in the game, but, pinned back to their 17 yard line, elected to keep the ball on the ground. On the day, Austin Walter ran 18 times for a career-high 165 yards and two TDs. Afterwards, though, he said he didn’t particularly think he’d had a good day. Rice head coach Mike Bloomgren did his best take positives from the positively awful day, saying he hoped this debacle marked the nadir of the season and things would begin to improve markedly, starting with next week’s home bout with UT-San Antonio. WINSTON-SALEM (Sept. 28) – In a half-way rational world, two institutions such as Rice and Wake Forest would be expected to line up on even terms on the athletic field, and go toe-to-toe in their game coming up here Saturday (2:30 CDT). Similar academic philosophies, commonly small enrollments, generally equivalent aspirations, if not out out-and-out scholastic peerage, at least in the same echelon – one could hardly expect any more evenly-situated athletic opponents. But here we are, on the eve of tomorrow’s kickoff between the Owls and the Demon Deacons (huh?) in Winston-Salem, and the contest is being described by local scribes, and assumed by local hoi-polloi, as a virtual week off for the local contingent. Such is the lot with which Rice must face, as it strives to escape the nadir of a long, downward slide away from major college athletics relevance. Now it is true that there is a new management present on South Main, and differences in approach and style and effort can be seen already, on the gridiron, in the locker room, and around athletic climes generally. Still, after last week’s disappointing loss to Southern Mississippi, one could hardly expect any self-respecting Power Five program, either on the field or among the stands, to consider this week’s opponent in any other way. And yet there exists at least some evidence to suggest that Old Gold and Black clad fans populating the bleachers of BB&T Field here Saturday might have reason to find their pulse a bit quickened, if not hopes completely dashed, by the team Coach Mike Bloomgren trots out in their all-white padded PJs. Let’s look at this opponent’s record. They’re an even 2-2 on the season, which comes to the Deacs as a mild disappointment, what with their 2017 season-capping bowl win over Texas A&M in the Belk Bowl. The Demon Deacons (quick fact: they’re a Baptist-affiliated school, kind of a politcally correct Baylor) managed a 23-17 overtime win over the Tulane Green Wave in New Orleans to open the season– hardly a shot heard ‘round the world. They then added a 51-20 win over powerhouse Towson State, a Baltimore school that compares less than favorably to the University of Houston. Then, at home for the first time, and in the shadow of an oncoming hurricane, they lost to Boston College, 41-34 after havimg been favored by a similar tally. The Wake defensive secondary was laid bare in that loss. Next came the home game of the year, a bout last Saturday with Notre Dame – hmm, Catholics versus Baptists – where in the Domers pounded the home team willy-nilly, taking a 49-13 lead into the fourth quarter before giving up a couple of garbage-time TDs leading to a 56-27 final score. The Wake Forest defense was so impressive in that one, that the result had the team’s defensive coordinator summarily been given the pink slip, whereupn the WF defense is new being managed by a troika of defensive assistants. What we’re trying to say is... these guys put their pants on one leg at a time, too. They’ve allowed 97 points across their last two games; sure it was against BC and ND, but the Rice defensive fails have come against high-tempo, high-scoring outfitls Houston and Hawaii, as well. The Golden Domers rolled up 556 offensive yards while scoring eight touchdowns against the Southern Baptists. Granted, ho-hum, the Irish are currently ranked number eight in the nation. Not that we’d ever wager on our Insitute Boys, one way or the other, but it’s informative to consider Wake's season success against the bettors’ point spread. In a nutshell, there hasn’t been any. The Deacons are 0-4 against-the-spread in their last four games following an ATS loss, and also 0-4 against the spread in their last four home games. Continuing....Wake Forest is also 0-4 ATS in their last four non-conference games and 0-6 against the spread in their last six games overall. The betting spread in Saturday's Rice-Wake Forest game? 24.5 points.